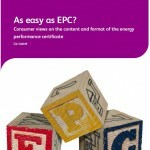 30 June 2011: Consumer Focus research found that consumers pay little attention to the EPCs when they move house. 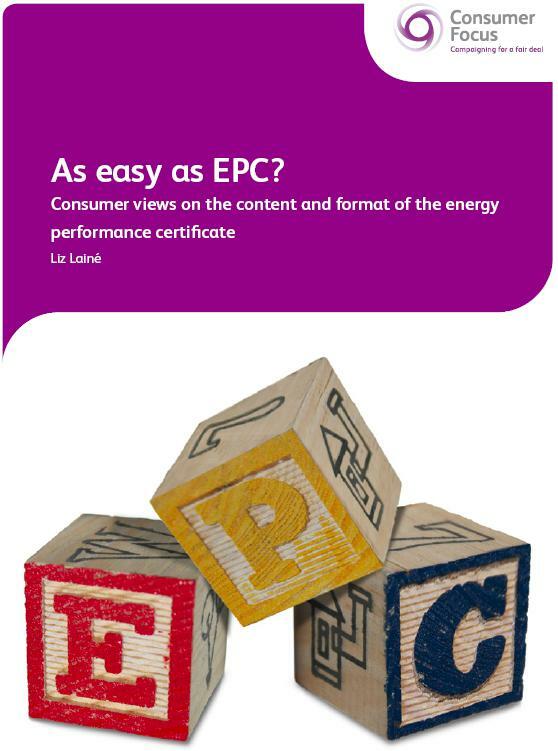 It found that EPCs give consumers no real sense of how the ratings translate into financial benefits or how to compare running costs between properties. Consumers are put off by technical language, would prefer more concise information and are confused by two separate ratings on the property for energy efficiency and environmental impact. How take up of energy efficiency measures has varied between types of property and household. Statistical comparisons of gas and electricity consumption in 2008 by property and household types. Analysis of the savings made by households that have installed energy efficiency measures(for example cavity wall insulation or condensing boilers). The initial analysis report and two accompanying spreadsheets are all downloadable from DECC’s Energy Efficiency Statistics webpage. A summary of the findings are provided in an article in the June issue of DECC’s Energy Trends journal. 30 June 2011: Short article in latest issue of DECC’s Energy Trends quarterly journal, published today, providing the latest national renewable energy statistics for the UK. The analysis finds that “Renewable energy provisionally accounted for 3.3 per cent of energy consumption, as measured using the 2009 Renewable Energy Directive methodology. This is an increase of 0.3 percentage points from the 2009 position of 3.0 per cent.” The UK’s 2020 target is for 15 per cent of UK energy needs to be supplied from renewable energy sources. 30 June 2011: According to a National Audit Office (NAO) report released today “There are major risks the Department of Energy and Climate Change must address to achieve value for money from its £11.3 billion national programme to install ‘smart’ electricity and gas meters in all homes and smaller non-domestic premises in Great Britain from 2014 to 2019.” Amongst the conclusions made in the report, the NAO highlight that DECC “expects smart meters to help the average dual fuel 7 customer to save £23 a year by 2020, if they change their energy use in line with the Department’s estimates. This overall benefit depends on suppliers minimising costs and passing on all their efficiency savings through their prices.” Further information on the recent smart meter trials mentioned in the NAO report are set out in Ofgem’s Energy Demand Research Project published earlier this week. June 2011: Final analysis of Ofgem/DECC major Energy Demand Research Project (EDRP) has just been published. EDRP was a behaviour change trial designed to help better understand how domestic consumers react to improved information about their energy consumption over the long term. The project involved over 60,000 households, including 18,000 with smart meters. Measures were generally applied at household level but one supplier (SSE) also tested action at community level (none of which were unfortunately in London – the results of these community trials are detailed in Appendix D of the report). The results are too detailed to summarise here- but the 10 page Exec summary makes interesting reading. June 2011: Gentoo has published a report which outlines early findings from the Pay As You Save (PAYS) trials. The DECC sponsored pilot currently incorporates 117 properties where energy efficiency improvements including condensing combi boilers, double glazing and solar PV panels have been installed with no upfront costs to the customer. The costs of these improvements are being recovered through a weekly PAYS charge to the customer. Gentoo has used experience from its previous energy efficiency Retrofit Reality project to ensure that customers are not charged more than they will save. 29 June 2011: An interesting speech by Chris Huhne, the Secretary of State at DECC, delivered today to the Corporate Leaders’ Group, setting out the benefits of ‘green growth’. Provides a useful overview of the current activities by governments around the world to invest in the transition to a lower carbon economy. Read the speech here. The scheme will be introduced in two phases with non-domestic sectors targeted first – that is larger heat users in the industrial, business and public sectors. Tariffs for the various technologies within this phase (ie non-domestic scale projects) were announced in DECC’s March RHI press release. Regulations around the October 2012 domestic/household phase of the RHI will be consulted upon next year. Further details on the RHI are on DECC’s website. Ofgem, who will administer the scheme, have today launched a detailed (two volume…) consultation on the eligibility criteria for installations wishing to apply for the RHI, including requirements such as the regular submission of heat data, meter readings and fuel data for certain bioenergy installations. 24 June 2011: A Which? undercover report shows how some solar panel companies are using dodgy sales tactics and are giving poor advice to people looking to buy PV panels. Further information on their survey as well as Which’s online guide on how to buy solar panels, which includes information on solar PV costs and payback times here. June 2011: A draft British Standard – BS 8904, Guide to the sustainable development of communities – has been issued for comment by the BSI. The draft states that “There has been growing interest in the concept of “sustainable communities”. Communities are the bedrock of sustainable development. This guidance will help interested parties to define what sustainable development is in their communities.” Registration is required to access the draft and comments will be accepted up to 31 August 2011. 23 June 2011: Ofgem have produced a summary set of statistics on the first year of the Feed in Tariffs (FITs). The newsletter highlights regional differences in the take up of the FITs, and shows that London has the second lowest level of installed capacity of renewable energy, and also the second lowest level of registered installations, across the UK. 22 June 2011: DECC have today published an updated Microgeneration Strategy focussing on non-financial barriers to the deployment of microgeneration technologies. Chapter 5 specifically considers community scale generation opportunities with the Government stating it will take forward activities on helping provide guidance on planning (see PlanLoCaL for further information), finance, sharing best practice, and identifying barriers and possible solutions to the uptake of microgeneration. Dissemination of information will be through a series of events and through DECC’s Community Energy Online portal.